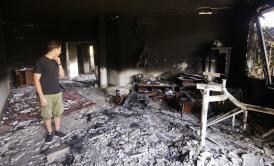 State Department says Innocence of Muslims didn't prompt Benghazi attack. The State Department now says it never believed the Sept. 11 attack on the U.S. consulate in Benghazi, Libya, was a film protest gone awry …. The State Department’s extraordinary break with other administration offices came in a department briefing Tuesday, where officials said “others” in the executive branch concluded initially that the protest was based, like others in the Middle East, on a film that ridiculed the Prophet Muhammad. That was never the department’s conclusion, a senior official told reporters. The disclosure all but assures fireworks at a House hearing later today on diplomatic security. Republicans have accused the State Department of failing to respond to the security fears of its diplomats in Libya in the months before the attack, and have also accused the White House of trying to downplay a threat for which it was unprepared. Related reading: The Washington Post has a good look today at how the Benghazi attack and the political fallout could mar Secretary of State Hillary Clinton’s legacy.